This map is from Victor Levasseur’s ‘Atlas Universel Illustre’, one of the last decorative atlases to be published. 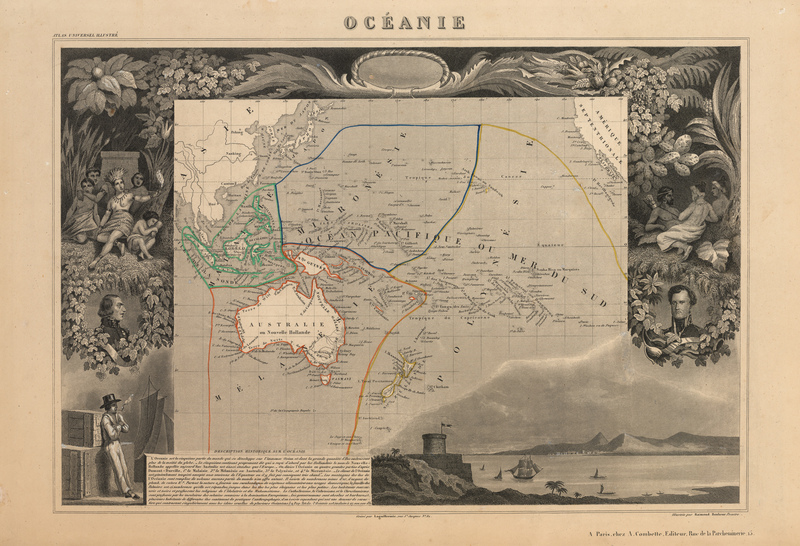 The map covers the entire South Pacific from Sumatra to the California Coast, focusing especially on Australia, New Zealand, Indonesia, and the islands of Polynesia. Seagoing vessels of various design sail the waters. The whole is surrounded by elaborate decorative engravings designed to illustrate the indigenous peoples and their customs, and the bounteous trade riches of the region. A sailor leisurely smoking a pipe leans back against wooden cargo crates while looking out at the billowing sails of a passing ship. Two Europeans in formal military dress are also included. A short history of the region is included along the bottom border. Victor Levasseur was an important French engineer, cartographer, and engraver of the mid 19th century whoheld a number of important cartographically related political and educations posts in France. He is most famous for his Atlas National Illustré des 86 Départements et des Possessions de La France, a large decorative atlas of France, including his Planisphere and five important continental maps. Levasseur's maps are distinctive for their wide decorative margins containing elaborate depictions of the scenery, peoples, and trade goods of the areas he mapped. Levasseur maps are also known to offer a wealth of statistical data. Until recently, very few Levasseur Atlases migrated out of France where they were mostly used in public libraries and town halls. Condition: This map is in A condition with slightly uneven toning and some foxing.